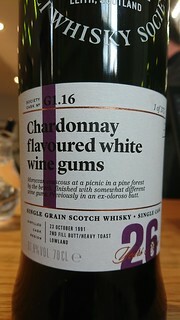 The nose has cedarwood, wine gums, a little sherry. The mouthfeel is thin with no cling. The body has pineapple, cedarwood, sherry and some wine gums. The finish has pineapple and sherry. Water brings out thin, rapidly expanding whorling that doesn't quite mottle. The nose gains more sherry and loses the cedarwood. The body gains more sherry and more of the wine gums, and loses the cedarwood. The finish gains more sherry. Anyone who says grain whisky can't be interesting is wrong. But don't tell them that - let's keep it to ourselves, right? One for ending summer evenings.